Whether your base is Alaska or Minnesota, Inuvik or Chicago, winter brings problems with frost, snow, and ice contaminating your airframe; and the cold requires that you not only preheat your engine, but also utilize special operating procedures while in flight. In addition to these problems, the Northern pilot must deal with the difficulties created by the vastness of the Arctic, its small population and widely scattered communities. Here, far more than elsewhere, you must take into consideration range and alternates, both VFR and IFR, and include them not only in your basic operating procedures but within your mindset as well. 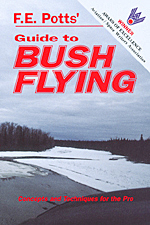 For bush flying is, if nothing else, a thinking man's game, and how well you think (and look ahead, anticipating potential problems) determines not only how sucessful you are in completing your assigned flights safely and economically, but also your very survival. In bush flying, it is the small (what some call "minor") details that most often bite you. That slight dusting of frost left on the wings combined with a short runway, for example, or the unexpected weather that suddenly leaves you trapped without an "out," a safe haven where you can take refuge. So, let's take a look at some of the more prosaic details of the bush pilot's profession, those without glamour or mistique, only utility.